At just 23 years old, this national champion has already made quite a name for himself. When it came time to meet Honor Allen, he had just finished up a full day’s shift at Hunt’s Oyster Bar & Seafood Restaurant. 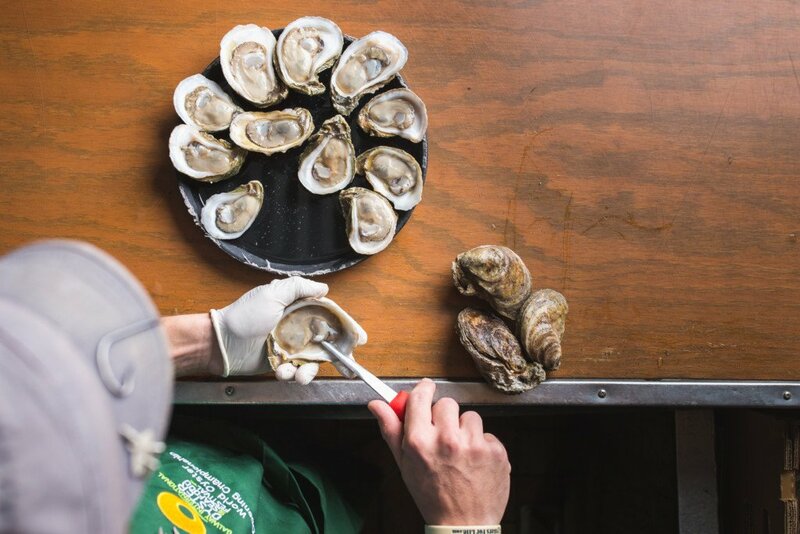 As soon as he washed his hands of the hundreds of oysters he’d shucked, he took a seat at the bar to read Oysters: A Celebration in the Raw by Jeremy Sewall and Marion Lear Swaybill. This is just one title from his compendium of all things oyster, from which the 23-year-old absorbs detailed accounts from farmers, fellow shuckers and restaurateurs, often jotting down notes along the way. When his hands aren’t occupied with shells and knives, you can believe he’s learning more about them. 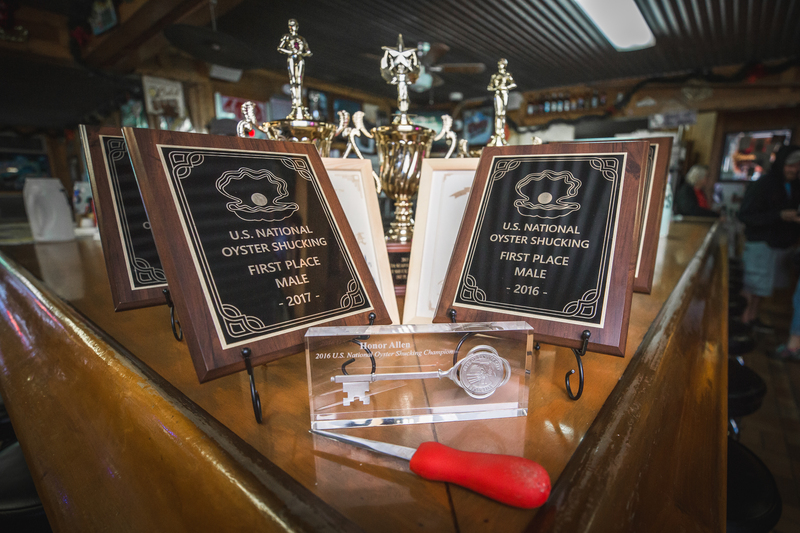 It’s precisely this passion that has landed the Panama City native multiple National Oyster Shucking Championship titles, and a rank among the fastest oyster shuckers in the world. But, his fame had small beginnings. Allen grew up with four older brothers and three sisters in the St. Andrews area, where he recalls doing anything he could to pitch in. “I was doing anything I could do get out of the house and be outside,” Allen recalled. At the age of 12, Allen found himself at Hunt’s Oyster Bar, where his family decided to dine one night. Enamored with the environment and with the quick work of the shuckers, he decided that the following day, he’d return and see if he could help out. “I thought I could show up and say, hey, remember me? I ate dinner here last night!” Allen laughed. It wasn’t until Allen was 18 that he was allowed to join Hunt’s as a full-time shucker. Now on the clock, the young man was shelling out thousands of oysters a week. That year, Allen’s friend, co-worker and brother shucker, Max Dawson, had plans to attend the Florida Seafood Festival Oyster Shucking Contest. When Allen expressed interest, Dawson thought he was easily talented enough to compete. For Allen, that first competition was an eye-opening experience. “I didn’t realize what it would be like on stage with dozens of other shuckers,” Allen said. It took Allen a couple of losses to strengthen his competitive morale and properly train. When he finally took first place in 2015, he was shipped off to Maryland a year later to represent Florida in the U.S. Oyster Festival’s National Oyster Shucking Contest. 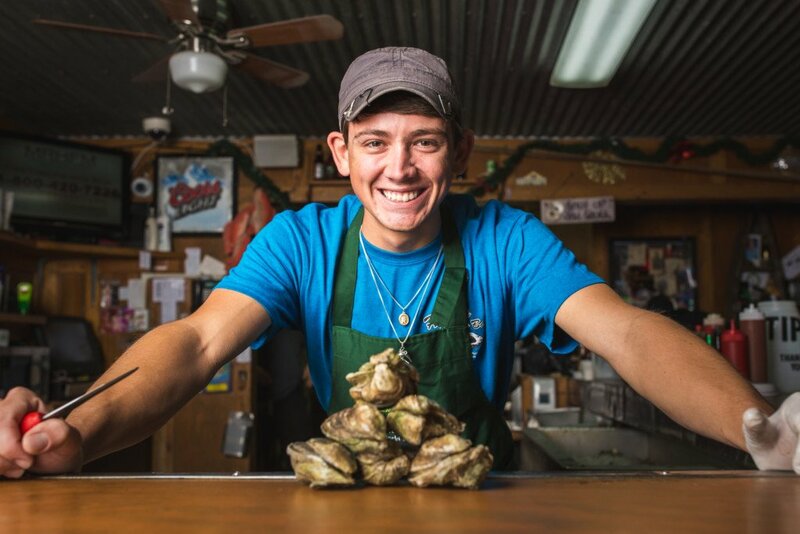 You can imagine the youth’s surprise when he snagged first place in his very first national competition, deeming him the fastest shucker in the country. The national title meant Allen’s next stop was 2017’s Galway International Oyster Opening Competition in Ireland. Returning home from nationals, it was still sinking in that he was the quickest shucker in the states, as he contemplated having a year to train for competition on a global stage. Research began instantly. Shucking in Ireland would be a completely different ballgame, as participants are required to work with the Ostrea Edulis, more commonly known as the European Flat Oyster. While the Apalachicola oysters Allen works with on a daily basis are more of a teardrop shape with a deep cup, the European Flats have a wider base and are more circular, requiring a different grip and knife to open them. Allen partnered with Jennifer Vigil, President & CEO of Destination Panama City, to get a shipment of a similar species of oysters with which to practice. Funded by Robin Malpass, a film producer and director based in Chicago, a crate from Maine arrived to prepare Allen for the infamous Edulis. Only two shuckers from America have ever won the international competition, one of which is William “Chopper” Young. Allen was lucky enough to meet Young, his idol, at nationals and receive a few pointers. “Chopper took me aside and said, look man, I have this knife,” Allen imitated. Sure enough, Chopper took the title in 2008 with that very single-bladed, Helgess brand knife. It was an honor for Honor to be passed the blade, something for which he will be forever grateful. Months prior to visiting Ireland, Allen flew to Shanghai for the 2nd Annual China National Shuck Off Festival competition, where he placed 4th out of 11 competitors. More important to him was the top-notch advice he received from former victors. “I got to hang out with six world champions who came over to compete, so I have to say that was one of the biggest blessings of my journey,” Allen said. Wielding his new knife and new knowledge, Allen impressively took 13th place at Galway. He’s ecstatic about his rank and even more determined to climb to the top with next year’s trip to Ireland, as he has yet again scored U.S. national champ for 2017.